A glossy, slick, re-imagining of the source material that, while not hitting the thematic/philosophical heights of previous iterations, remains an interesting and visually stunning watch. Arriving amidst much talked about controversy, Hollywood’s ‘reimagining’ of the now iconic and seminal Ghost in the Shell manga/anime finally made it’s debut. Up until now, there really has been no successful transition from east to west in terms of re-adapting for a new audience, whether it be the turgid Dragonball Evolution or the inoffensive yet boring Astro Boy, Hollywood have yet to really find its feet in such material. However, with the star-power of Scarlett Johansson as the lead and a mega budget to boot, audiences were cautiously optimistic about this adaptation. Part re-imagining, part homage, this iteration of Ghost in the Shell follows the story of Major Mira Killian (Scarlett Johansson), a former human whose brain was retained and placed inside a cybernetic ‘shell’ (making her the first of her kind), as she and her task force Section 9 attempt to track down a terrorist who has been hacking into the minds of his victims. For those familiar with the source material, the film heavily riffs on the previous adaptations of the source material. Merging plot beats from both the 1995 feature length anime and the stand alone complex series into a mishmash of different storylines and arcs. For the most part, screenwriters Jamie Moss and William Wheeler, with the help of script doctor Ehren Kruger, manage to juggle and integrate these various inspirations into a cohesive and linear narrative. Despite a third act that threatens to derail its progression with a cheap narrative shift, it pays homage and love to its source material without feeling too derivative or lazy. Considering the trepidation that most fans had going into this version in terms of whether they’d be getting an essential ‘remake’ of the anime, the way that they have gone about their business must be recognised. Breathing the script to life behind the camera was far from an easy task. The world that the source material and subsequent adaptations have built has been aped, stolen from and ‘re-tooled’ in countless other science fictions since its inception. The task from the fairly inexperienced Rupert Sanders, it would seem, was to be able to create a world for his characters to interact with and be a part of that was innovative and fascinating. In this aspect alone, Ghost in the Shell passes with flying colours. Every single frame that graces the screen is gorgeously rendered and realised. From the sprawling hyper-futuristic cityscapes, to the murky underground settings, Sanders’ eye for visuals is on show for all to see. Despite the often busy shots, he never loses focus of his characters but immerses them in this fantastical world that is a feast for the eyes. The ‘shelling’ sequence that defined the opening of the 1995 version is beautifully remastered in this live-action world and immediately lets you know that if anything, you’ll be sitting through a sumptuously visual treat. Similarly, his action sequences ebb and flow and drive with purpose and fantastic visual flourishes. It’s hard not to simply gawk at some of what you’re seeing on screen and if possible, it would be a shame not to see it on an IMAX screen. On a purely surface level, the script and most definitely the visuals, are assured and sure-footed. However, as many fans of the source material will tell you, they are only half the story. What made the original 1995 version so loved (as well as the series) was it’s ability to balance the unique world and visuals, with just as much depth. The nature of what makes us human, what is consciousness and what are we without it, is so deeply intrenched in the lore of Ghost in the Shell and is frequently delved into, discussed and dissected in its many versions whether it be the manga or the anime. It’s no coincidence that it has inspired countless ‘copycats’ that borrow from its mythology such as The Matrix and Dark City and continues to be discussed in terms of its importance to science fiction as a whole since it first arrived. Unfortunately, these themes and ideas rarely get the chance to breathe in this rendition. Although they haven’t been completely left out, they are only briefly touched upon and not nearly in enough depth as anyone could’ve hoped. Despite clocking at 83 minutes, Mamoru Oshii’s 1995 effort expertly balanced its themes within the story and provided a perfect example of how to do so. Its hard not to talk about the cast when discussing the film and, with it, its controversies. Calls of ‘white-washing’ and ‘cultural appropriation’ have been rife in the publicity of this movie and have unfairly overshadowed most of the conversation. Ironically, the issue is addressed in the film’s narrative in an interesting way. Purists might get turned off by the way it does, but it shows that they were conscious about the controversy the casting might cause. 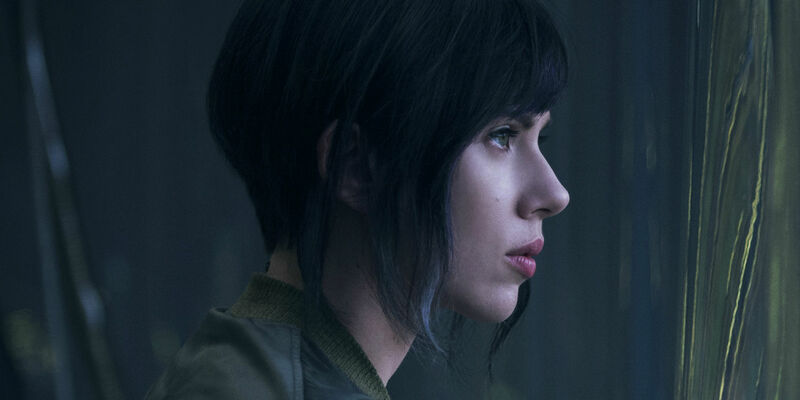 That aside, Scarlett Johansson is very solid as The Major, showing a restrained and detached yet steely side to the character. She is surrounded by a great supporting cast in Pilou Asbæk, Michael Pitt, Juliette Binoche and Takeshi Kitano but to name a few. Everyone fits into their roles suitably well and controversy aside, put in some very watchable perfomances. A special shoutout should also go to the score. Coming to fruition via a collaboration between Clint Mansell and Lorne Balfe, the pulsating, moody, electronic backdrop fantastically suits the aesthetic of the film and is worth listening out for. Ghost in the Shell (2017), directed by Rupert Sanders, is distributed in the UK by Paramount Pictures. Certificate 12a. Kinda sorta maybe like movies. So I kinda sorta maybe review them. Kinda. Sorta. Stoooodent, Pizza Enthusiast and reigning king over all things couch-potato.